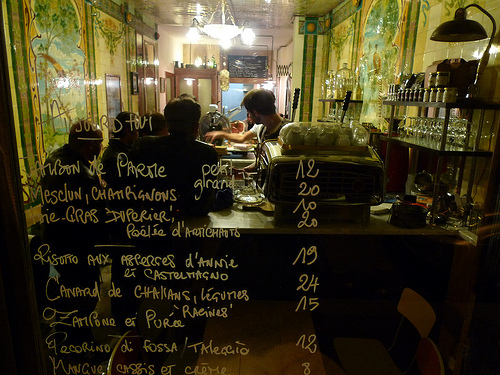 The restaurant Vivant, like many others in Paris, will close for several weeks summer. There will be little rest, however, for Pierre Jancou, who plans to open an adjoining wine bar/cave à manger and to revamp the offerings at Vivant. The current restaurant space will reopen as Vivant Table on August 28 with a new chef and more serious culinary aspirations. Chef Sota, formerly a second at Toyo, will expand beyond the simple product-driven dishes of the past, and prices will rise accordingly (as happened when Jancou installed Sven Chartier at Racines). After the rentrée, you can expect to pay 14-25€ for a starter, 25-40€ for a main and 10€ for a dessert. Fixed price “carte blanche” menus will also be available for 35€ at lunch and 60€ at dinner. Jancou himself will continue to manage the service and the wine at Vivant Table. Vivant Cave will open just next door around September 15, selling natural wine to go (no SO2) and food and wine to enjoy on site. The food here will be simple, recalling Jancou’s days at La Crèmerie, featuring lots of charcuterie and cheese (6-15€), sandwiches (5-8€), and daily specials for 15€ like rabbit and andouillette. David Benichou, who has a long history of pouring natural wines (at Vivant, The Ten Bells in NYC, and Le Garde Robe), will be the moustachioed face of this new annex, which will not accept reservations.